Folks living on boats with limited space such as myself are aware of the consequences of purchases. It's not just the money. Storage is critical, and it often comes down to a few specific issues. Is there a useful service it can provide? Will it rust, mold or get icky in a marine environment? You will note no place on that list is is the "Will it break?" line so often repeated. For certain items, I don't care if it gets broken. Some things are not that expensive. If or when it breaks, I'll simply buy a replacement. That's not to say I've always been of that mind. When I initially moved aboard Seaweed I opted for plastic. It was okay. At the beginning of this journey I had just two bowls and a couple of plates. That was sufficient, then. Later I met and made some friends with others enjoying life on the water. Being able to share a bowl of clam chowder (a specialty of mine) with other boaters necessitated the purchase of a couple more bowls. I ended up with four. 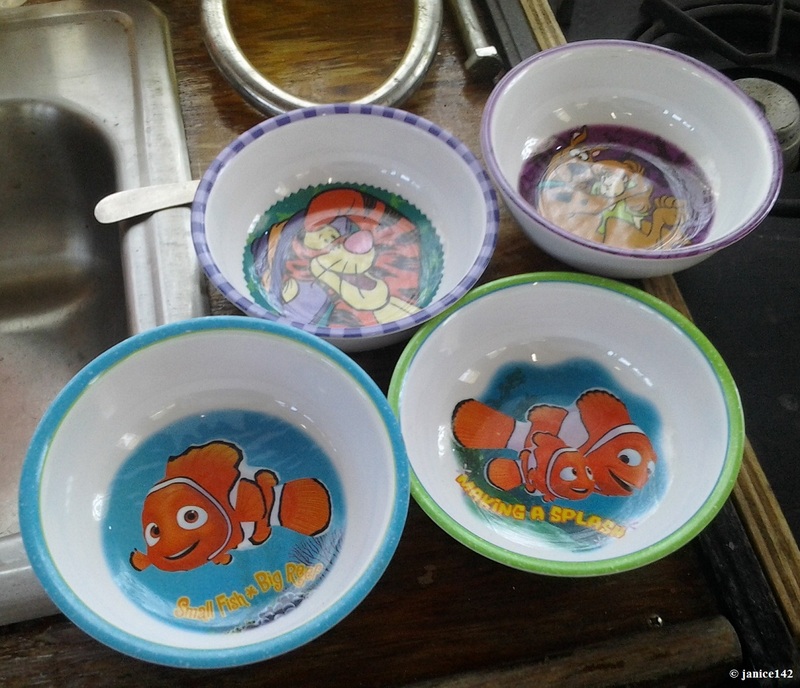 The bowls feature Tigger, Scooby and Nemo. I liked that they were similar without being identical. If one got lost, I could buy something to fit in with the group. But now I'm tired of them. They have to go. I wasn't so tired that I'd have thrown those four away, mind you. I became dissatisfied mainly because they now seem a bit juvenile. Okay, they are kid bowls, but unbreakable and at $3 a pop, retail, (what was I thinking to pay retail?!?) well, I wanted to upgrade. picking the very best and using only those things that bring pleasure. 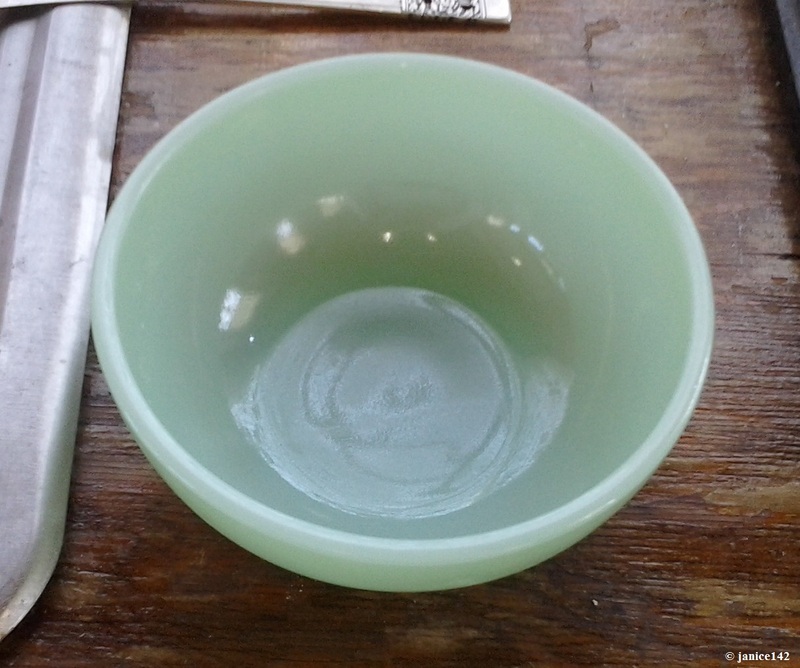 In the greater scheme of life, not a lot of cash was invested in the plastic character bowls. 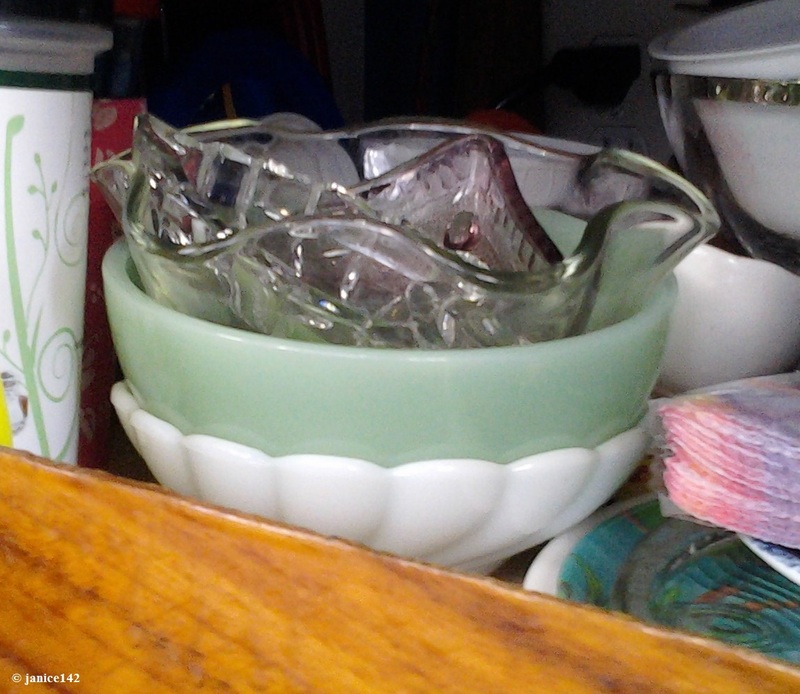 Thus, when I spotted a pretty green glass one at a local thrift store (exactly like some we'd had aboard our boat years ago) I bought it. I liked the color so for four bits* brought it home. *Four bits equals fifty cents. Two bits is a quarter. Now a bowl or two or even four is sufficient but now I was faced with owning seven bowls. On a 23' boat, that's ridiculous. Therefore I chose the three I liked best, and the rest will leave here shortly. Does anyone want my old plastic soup and/or popcorn bowls?!? When you own a boat, it's generally a good idea to take one item off for each you add. This time I'm removing four and replacing with one. Though I've less in quantity, I have more in desirability. Most important of all however is I like this group better. The Keepers I've tucked away in a neat little stack under my sink. Yes, I'm aware many people thrill to own and use matched sets of dishes. I'm not one of those folks. Eclectic works for me. And I do still have a pair of plastic plates (featuring Tigger and crew) that will be replaced at some point. I wish my grand liked Tigger because I'd send the whole lot to her. Plates and bowls... it's sort of a shame to break up the "set" but I'm moving off plastic and onto glass. When something breaks, I'll have the fun of shopping for a replacement. I am woman: I like to shop. Alas, Carrabelle isn't great in that department, though the friendly people make up for that to a large degree. 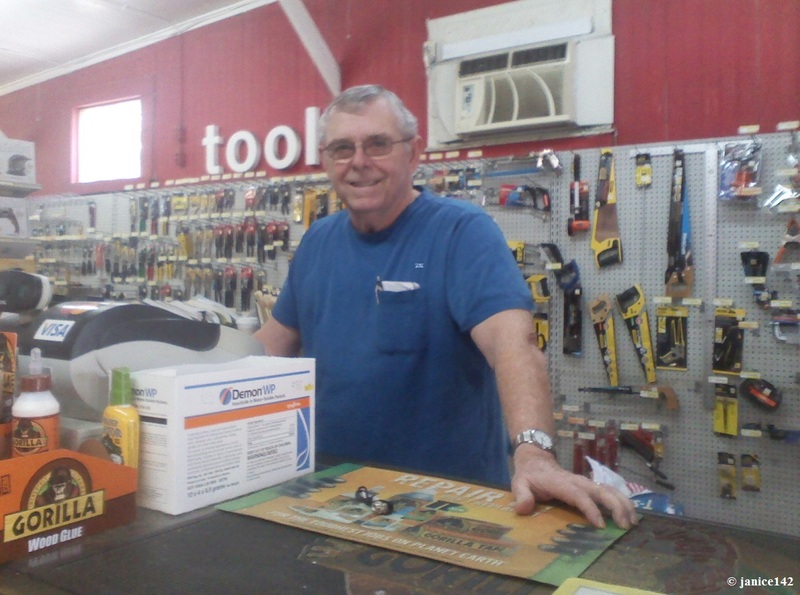 One of my favorite friendly locals, Mr. Gander from Gander's Hardware is having some health issues at present. If you could add him to your prayers, that would be wonderful. He's a real decent man. What sort of dishes do you use? Paper, plastic or glass/ceramic? A favorite aphorism: The best way to keep your kids out of hot water is to put some dishes in it.